Scott Sommerdorf | The Salt Lake Tribune New offensive coordinator Troy Taylor shouts some instructions during Utah football practice, Thursday, March 9, 2017. Utah’s tight end broke free in the back of the end zone and caught a pass for a 2-point conversion, four weeks too late. The work of first-year offensive coordinator Troy Taylor would be judged a lot differently if the Utes could trade Siale Fakailoatonga’s catch last weekend vs. Washington State for a 2-point attempt that broke down at USC, preventing them from winning. “Can we do that? That would be awesome,” Taylor said, smiling and playing along. What-ifs aside, my evaluation through 10 games of a season that may or may not end in a bowl game leads to two conclusions: I expected more production from Taylor’s offense. And I’ve seen enough to believe it will improve significantly in 2018, with a returning quarterback, an improved offensive line and more familiarity with the scheme. This theory, of course, assumes Taylor will be on the job beyond Valentine’s Day, exceeding the 13.4-month average shelf life for coach Kyle Whittingham’s previous seven play-callers since the 2009 Sugar Bowl. The offense’s outlook would become considerably more bleak if the Utes (5-5) don’t reach a bowl game, a potential failure that would require losing to Washington this week and Colorado next week to finish last in the Pac-12 South. If that happens, no way could Taylor’s work be considered adequate, while making for another long winter of wondering if Utah’s offense ever will be fixed. “Obviously, we have had some growing pains,” Whittingham said this week. Disclaimers are available, with Huntley’s first season as a starter disrupted by a shoulder injury and an offensive line that replaced four NFL players also affected by injury. The problem with those explanations is Utah’s defense has thrived with a rebuilt secondary and overcome its own series of injuries. When fill-in linebacker Donavan Thompson became Utah’s nominee for Pac-12 defensive player of the week after the Washington State game, the offense lost its go-to excuse. Taylor has done what he was hired to do, improving Utah’s passing game. 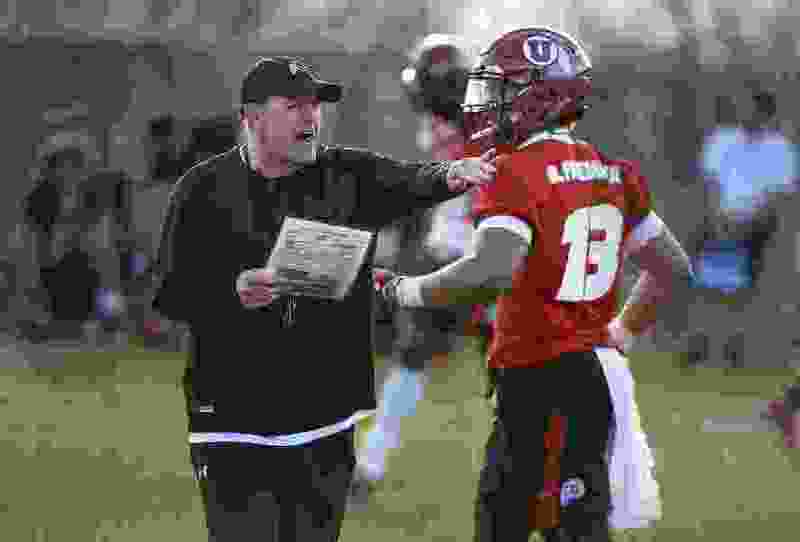 The Utes are throwing and catching the football like a modern team, producing easily the best passing statistics of the program’s Pac-12 era. Quarterback Tyler Huntley’s 305-yard effort in a loss to Washington State, even with star receiver Darren Carrington II sidelined due to injury, is a good illustration — never mind that Huntley threw three interceptions and lost a fumble. And the offense’s total yardage per game is down from 430.7 to 411.1 this year. Utah ranks eighth in the conference and 56thnationally. In Pac-12 play, the offense only once has been responsible for more than 25 points, scoring 48 against UCLA’s poor defense. Otherwise, the Utes needed defensive touchdowns to score 30 points at Arizona and 27 at USC, where they could have used two more points in the end. The Utes partly have solved a big problem with finishing drives. But they lost a possible seven points against Washington State after Taylor got too clever, calling a reverse-pass play on first down from the WSU 13-yard line late in the first half. The play went for a 15-yard loss and Utah ended up missing a field-goal try. As a longtime high school coach who operated Eastern Washington’s offense in the Big Sky Conference last year, Taylor didn’t acknowledge any issues with his move to the Pac-12 level. “Mostly, the adjustment is [to] your own personnel,” he said. The Utes now have to face to Washington’s No. 4-ranked defense. Assuming they lose in Seattle, they’ll have to regroup for next week’s battle for bowl eligibility vs. Colorado’s more accommodating defense (No. 108). Thinking back to the start of the season, Taylor said, “You always go in with high expectations.” So did everybody else. But the Utes’s standards have been lowered again. Skipping ahead to next week, the Utes have to beat Colorado for Taylor’s first year to be judged as anything close to good enough. That’s hardly asking too much of him. 2016 • Rushing: 214.0 yards (32nd). Passing: 216.7 yards (78th). Total offense: 430.7 yards (51st). Scoring: 29.8 points (60th). 2017 • Rushing: 150.8 yards (78th). Passing: 260.3 yards (42nd). Total offense: 411.1 yards (56th). Scoring: 29.0 points (64th).